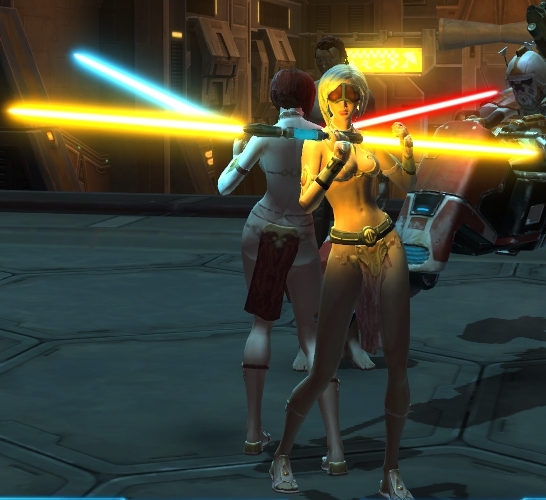 Hey look, half-naked jedi dancing in the starport. They've attracted the attention of this fellow on a speeder. It's like a train wreck. I can't turn away. But this dude has stripped down, ready to join them. At which point, I utter some uncouth language. Hahaha, oh man, it’s like a terrible rave party of debauchery. I guess we find them in every game. Any way to to stash them away in the SWTOR version of Goldshire? I’ve run into a couple of these sorts of dance parties. Always seems like some guy will come along and strip to join in. I was doing that in Beta with my Chiss Bounty Hunter. I managed to get him in synchronized with an NPC Twi’lek dancer in a Cantina in a Hutt Palace on Hutta on the first day I played this game hahaha. It was awesome. LMAO Thanks for the laugh on Tuesday Morning! !